The Citadelle, home to the "Van Doos," the Royal 22nd Regiment, is still the largest North American fort still occupied by troops. Occupying the highest point of Cap Diamant, 320 feet above the St. Lawrence River, the site was first built on by the French, but the majority of buildings were constructed by the British under orders from the Duke of Wellington, who was anxious about American attack after the war of 1812. The city is split into two levels, connected by stone stairways and a municipal lift. 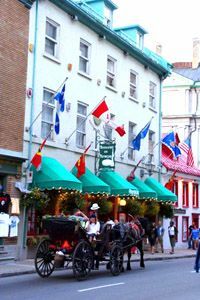 Surrounded by the old city walls is the 'Upper Town' with some fine 18th- and 19th-century architecture, notably the Place D'Armes and the Château Frontenac. The latter is a first-class hotel. 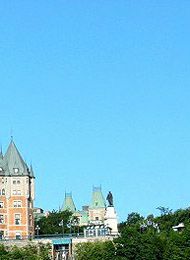 In front of the Château Frontenac is a wide promenade with 310 wooden steps leading up to the Citadel, which affords incredible views across the St Lawrence River. Small street cafés, cobblestone streets and shaded squares emphasize the European air of the 'Upper Town'. In the 'Lower Town', the network of 17th-century streets centered on Place Royale has recently been restored. 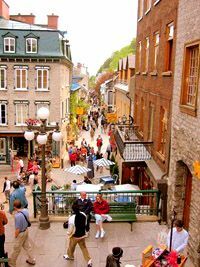 Outside of Quebec City, is a region of picturesque Québécois villages. In front of the Ile d'Orléans are the Montmorency Falls and further east, the Shrine of Sainte-Anne-de-Beaupré and Mont Sainte-Anne. The latter is the main ski resort in the famous Laurentians (or Laurentides) skiing region, which is also a provincial park. Heading northeast from Québec along the southern bank of the St Lawrence, the main route leads first through the farming region of Bas-Saint-Laurent and from there to the Gaspé Peninsula. The major attractions here are the Rocher Percé in the Gaspé Provincial Park and Forillon National Park. Across the mouth of the river is the Duplessis Peninsula, site of some of the earliest landfalls in the New World. Remains left by these Viking sailors can be seen in the museum at Sept-Iles, the largest city in the area. The bizarre geological formations of the nearby Mingan Archipelago are best explored by boat. The Magdalen Islands, 215km east of the Gaspé peninsula in the Gulf of St Lawrence, offer miles of white sandy beaches and a host of unspoiled fishing villages. 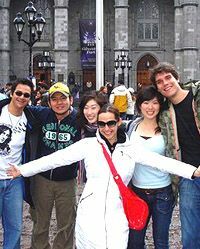 Our French language course allows you plenty of time to discover the culture of French speaking Quebec City. 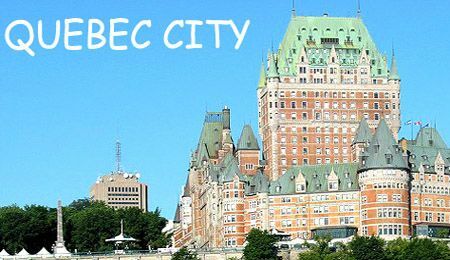 Learn French in Quebec City,enjoy your French learning vacation in this charming World Heritage (UNESCO) walled city, overlooking the St Lawrence River. :: Arrive independently into Quebec city. 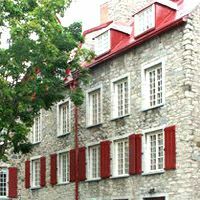 The school is located in downtown Quebec City, a short 15 minute walk from Old Quebec, which is a UNESCO World Heritage site. Please note: If you wish to stay closer to the school or in downtown Quebec City there is a surcharge of $15 USD per night. Enjoy social & cultural outings during the week with other students and optional weekend excursions. 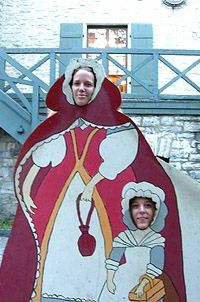 Typical cultural opportunities: Anne-de-Beaupré, Mont Sainte-Anne, Gaspé Provincial Park, Quebec Carnival. 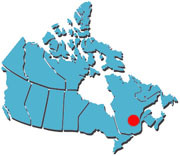 Quebec City has a small domestic airport located about 10km outside of the city. Most students fly into Montreal and either fly or catch a train to Quebec City (approx 2 hours).